Later in the evening we sat down to read a few of the books. Have you had the chance to read No, David! by David Shannon? We read it Saturday night for the first time and quickly realized that the David in the book is a very naughty boy. He pulls all sorts of shenanigans and gets into a pile of trouble. He picks his nose, jumps on the bed, chews with his mouth open, and plays baseball in the house. But I bet many of you didn't know that he also STEALS LIBRARY BOOKS!!! Yes, somehow the David in our book managed to sneak an extra library book into our bag. We think he hid it inside of his book! We didn't check it out. The book is not listed on our due date slip. Somehow we ended up with a book stowaway called Mrs. Pirate by Nick Sharratt. 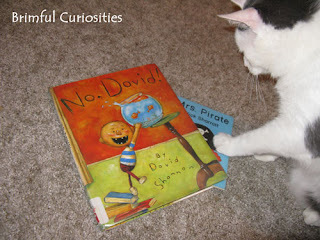 Either David stole Mrs. Pirate and tucked her inside his book or Mrs. Pirate jumped on board uninvited and hid in David's book. Yes, maybe we were too hasty with our accusations against David. Perhaps he is an innocent boy. Mrs. Pirate could just have easily snuck into our bag herself. After all, she is a PIRATE. Maybe she got sick of her boat and her underwear made to measure and thought it was time for a new journey to the uncharted territories of our home. One way or the other, we ended up with a book we didn't check out and two suspicious characters. Our cat is currently investigating the matter and will determine the culprit responsible for this terrible crime. In the meantime, we've separated the two ++Sha books and will not shelve them next to each other any time soon. Who knows what sort of mischief those two characters could get into together? After all, we don't want David telling us how he became a pirate! Ha ha ha! That is hilarious, especially that it would involve those 2 books. (And you wrote that so cleverly.) Love it! LOL....what a funny post! I can't say that I've ever had a library book stowaway, but now I'll be on the lookout!!! Thanks for brightening my day with your story. When I received your email update today, and finally had a moment to catch up and read thru it, I had to come over and comment on what a Cute Pic and blog entry!! Such a Nice end to my day! Yep, cats are certainly some of the best mystery solvers you can get - I have complete confidence yours will do the job!